It’s my last night at Baldface Lodge, a cat-skiing outfit with a spectacular 32,000-acre tenure in the Kootenay Rockies, British Columbia. Baldface has been operating for 10 years here and has a loyal following. Last Sunday, I drove from Bozeman to Canada with co-workers and friends. We spent our first day in B.C. skiing at Whitewater Resort outside of Nelson. We had a great time ripping sloppy cream cheese snow through trees on the new Glory Chair, even though it was pouring rain. I skied with my goggles up all day, and met some of the patrollers there. Afterward, I had a near-mythical experience in a Nelson coffee shop. When in Rome, eh? Later that afternoon, we rode in a helicopter and a snowcat up to Baldface. The place is an elegant but low-key spread of timber-framed and faux-timber frame buildings near a ridgeline overlooking mountains. Because Baldface is higher than Whitewater, the rainstorm we’d skied at Whitewater left a crust covered by a thick layer of very wet new snow at Baldface. The day after arriving, we laid fresh tracks through snow again reminiscent of a dairy product, this more like vanilla ice cream. That night, the storm petered out and the temps dropped, as did a few more centimeters of the white stuff. Yesterday, the sun shone through gray clouds, and views opened up in 360 degrees from the ridges and peaks. We did run after run of fast, cold powder in the trees. Our skis only sunk in 10 or 15 centimeters, but the turns were still forgiving. Today, the sun came out, and we saw the granite of the Valhalla Range, with its legendary Mount Gimli. A dark 2000+ meter north-facing wall on Mount Dag was also impressive. 1. The trees were all plastered with snow and rime, so you could barely see the needles. These are called ghost trees and are common at Big Mountain in Whitefish, Montana. I’d never seen them before and thought they were so cool. 2. Talking with the ski guides at Baldface was valuable for me. 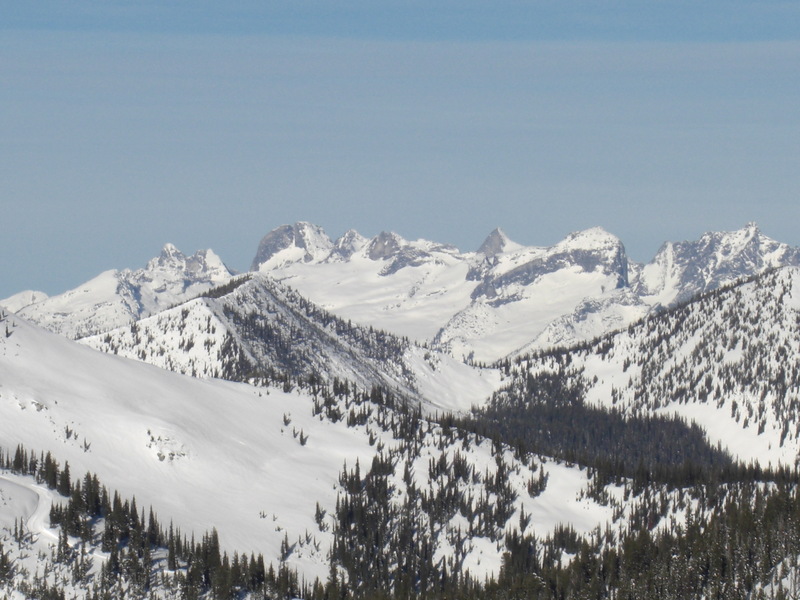 Intermountain snowpack is common in places like interior B.C., the Tetons and the Wasatch, and I don’t have much experience with these conditions. 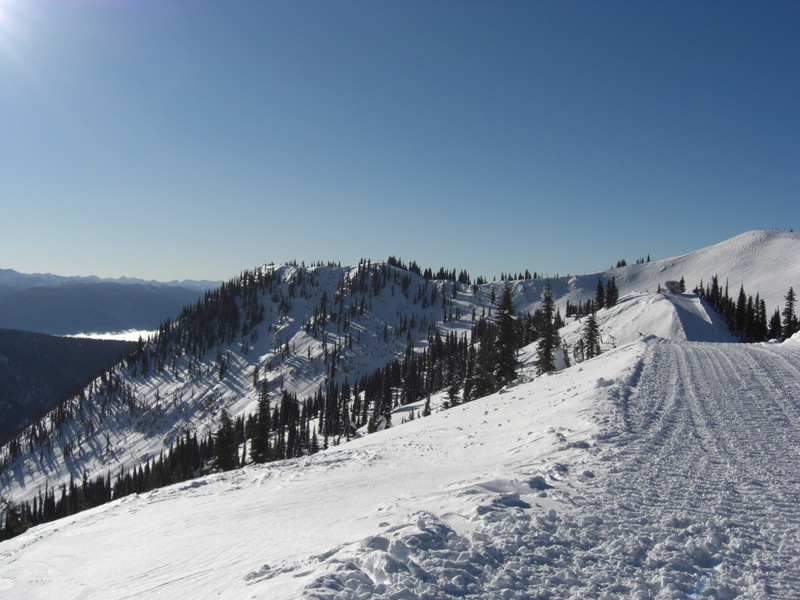 With intermountain, the layers of snow tend to be thicker, and there is less of a temperature gradient. Because of this, weak layers have a chance of healing. In Southwest Montana and Colorado, which have a continental snowpack, we look at terrain differently. 3. Getting to see my friend Brandy was awesome. She works on Moonlight ski patrol and also as a tail-guide at Baldface. 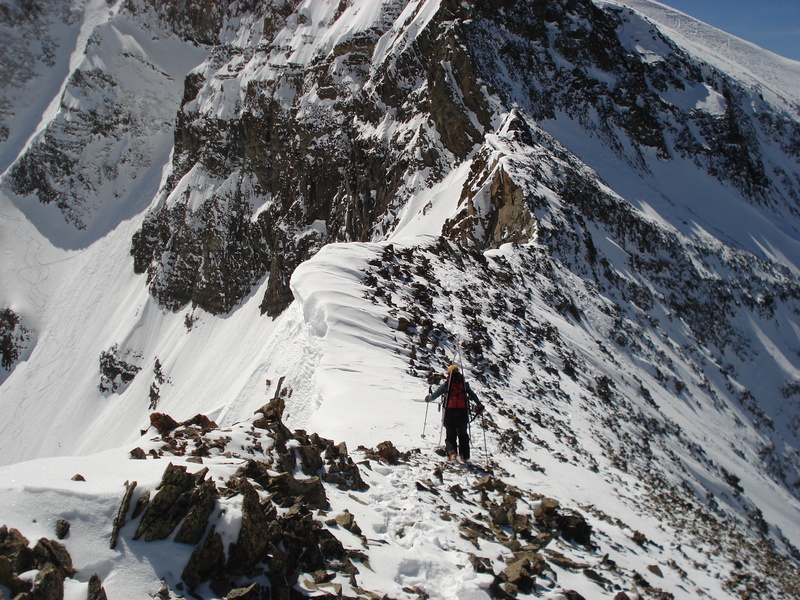 In this photo from April 2008, Brandy is hiking out the Headwaters/A-Z ridge on Lone Mountain. That day, she and I did a cool mission into Trident from the Headwaters. Addendum: The last day at Baldface we got quite a bit of light powder. Powdunga! (as Pat would say.) On the first run, it took me by surprise. I floated downhill, flying several feet above the ground and watching a river of sluff in my periphery. We spent the day “dungling” around in the incredible state of being that powder skiing creates: a mix of wild excitement and absolute calm. Total attitude adjustment. Totally awesome. This entry was posted in Mountains, Skiing, Travel, Work. Bookmark the permalink.